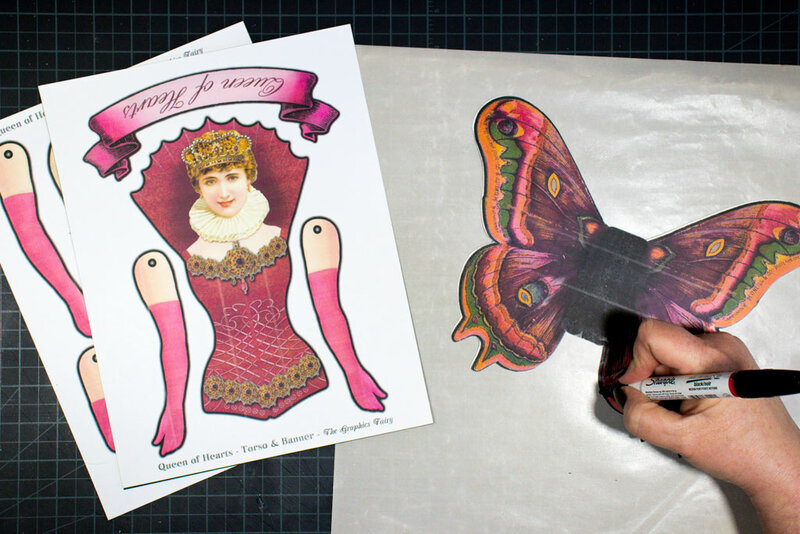 Make this fun Queen of Hearts Paper Art Doll! 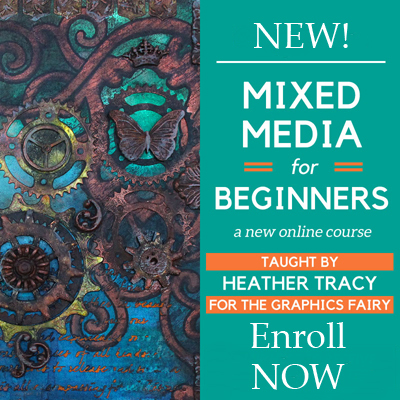 Hello, my Wonderful Graphics Fairy Friends! 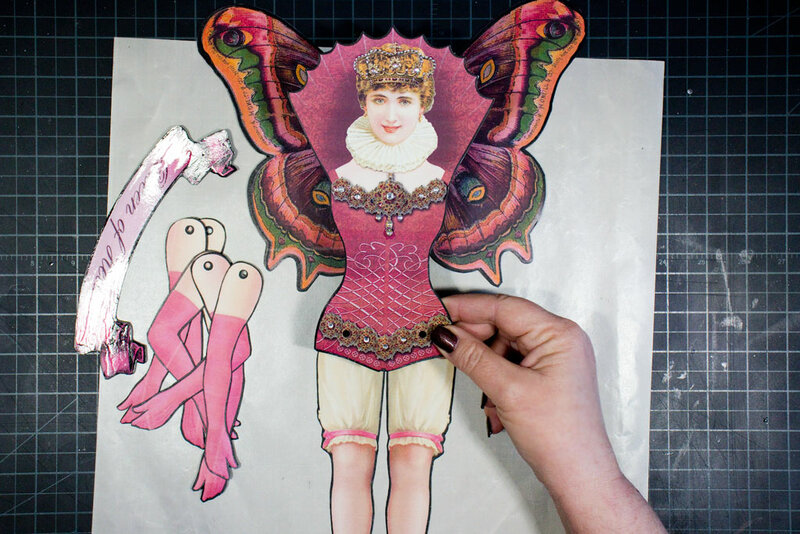 It’s Heather from Thicketworks, here to share a delightful Paper Art Doll project with you. 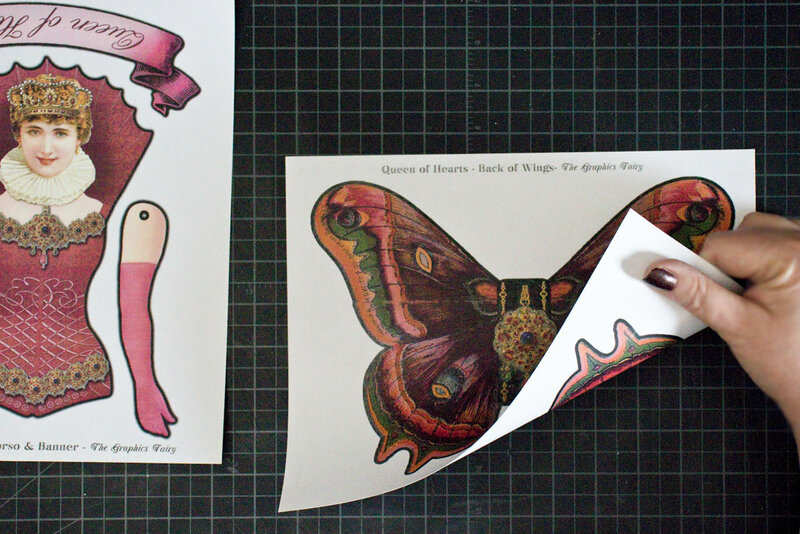 Print the graphics on sheets of White Midweight Cardstock. 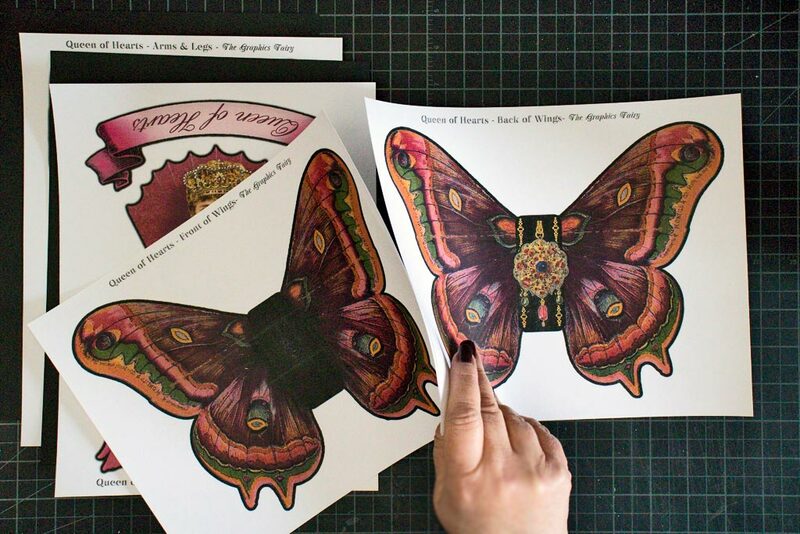 The Wings will adhere back-to-back and do not require a sheet of Black Cardstock. The double thickness of cardstock will be quite sturdy. 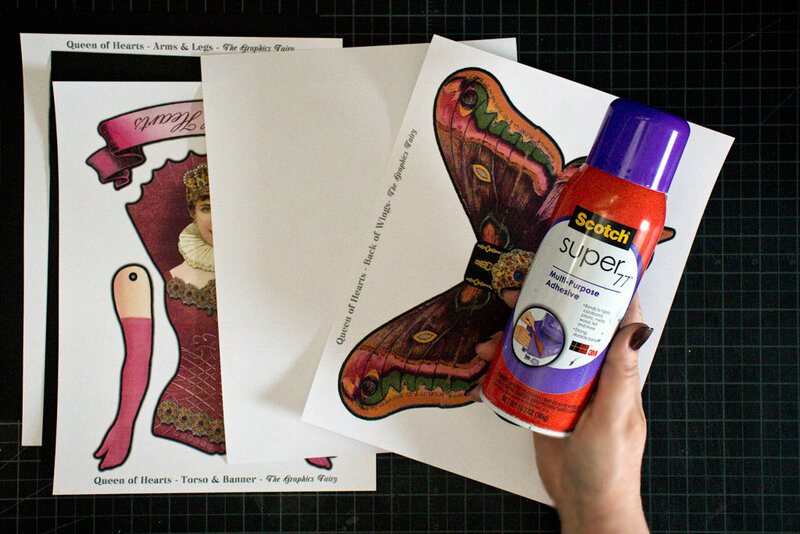 Next, glue each of the Art Doll Printable Sheets to a sheet of Midweight Black Cardstock, using Super 77. This will give the resulting figure a neat appearance from the back, and add sufficient sturdiness. 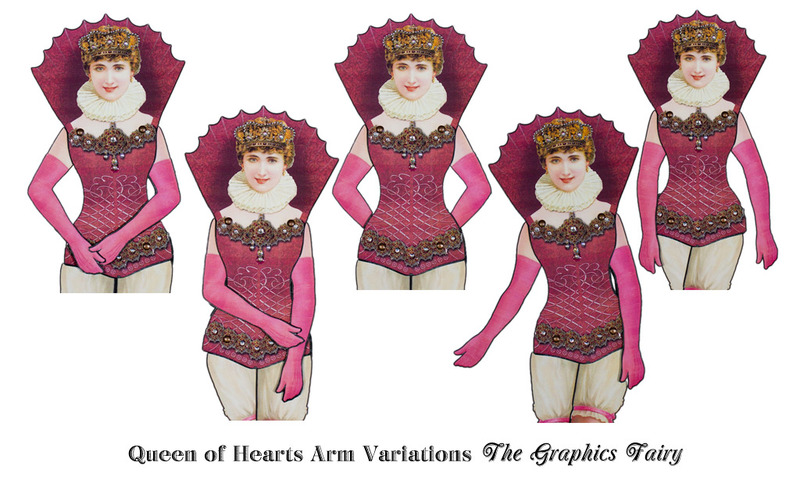 Before fussy cutting the arms of the Paper Art Doll, decide which of the postures you would like your Queen of Hearts to have. 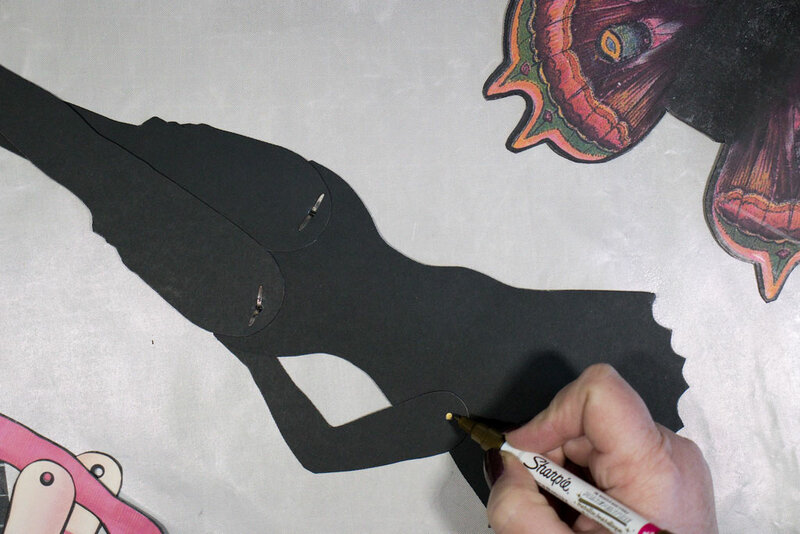 Variations have been included so that you can mix and match to customize your Paper Art Doll. Cut out only the arm shapes needed to create the look you prefer. 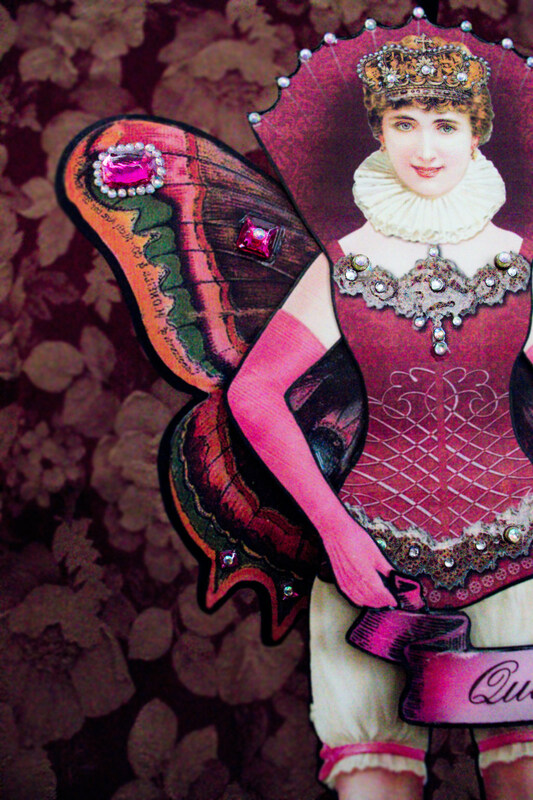 Fussy cut the Queen of Hearts torso, legs, the set of arms that you have decided to use, the banner and the wings. 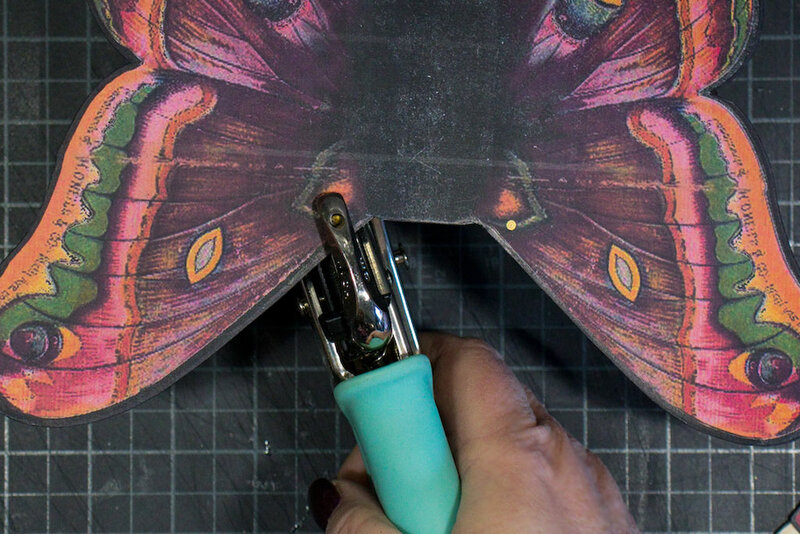 Darken the edges of the cut pieces with a Black Permanent Marker for a professional finish. Use a Crop-A-Dile to add articulation holes to the arms and legs. 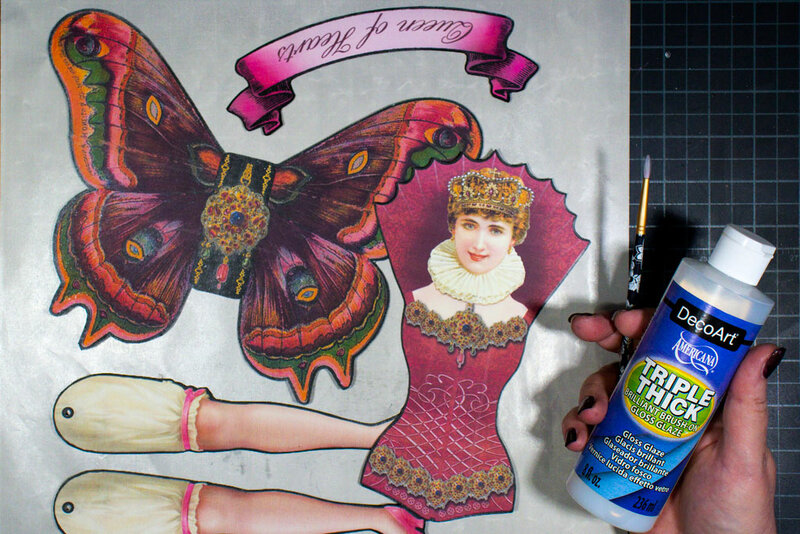 Before assembly, create shine and add interest by painting a layer of Triple Thick Gloss Glaze onto portions of the figure, the wings, and the entire banner. 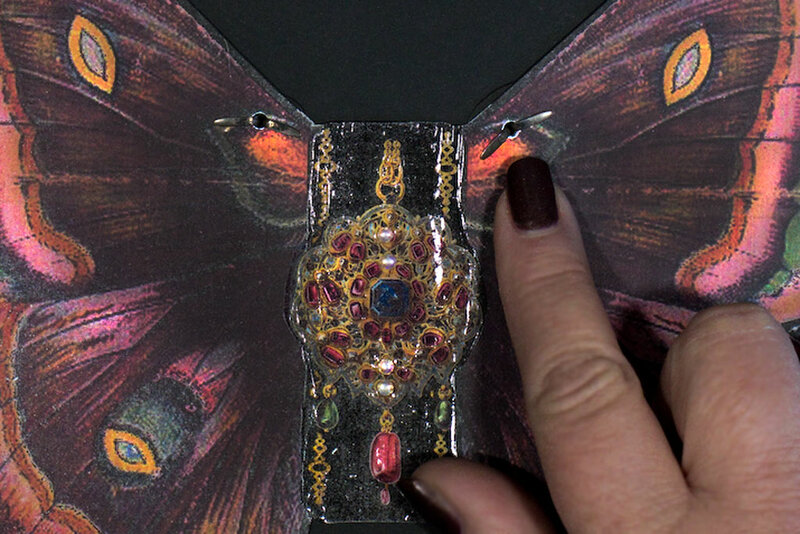 Here, you can see that the crown has been detailed with Triple Thick, as well as the jeweled back of the wings. Apply Triple Thick wherever you would like to create emphasis. 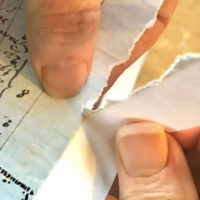 Use a Crop-A-Dile to punch out the shoulder articulation holes from the figure, using the marks you just made as guides. 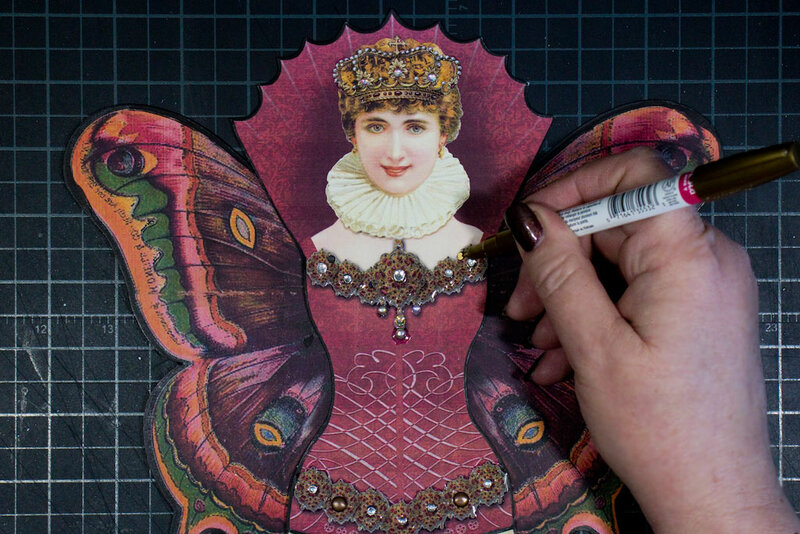 Position the figure over the wings, and mark the shoulder holes onto the wings with a metallic or white marker. Punch the holes from the wings, using your marks as a guide. Thread brads through the shoulders of the figure, the arms, and through the wings, securing all three layers together. Fold out the prongs to secure the assembly. 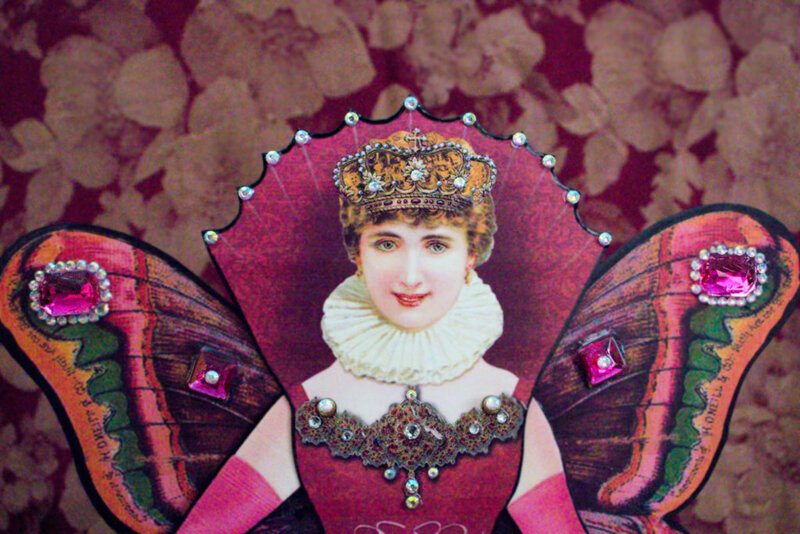 Embellish the crown, costume, and wings with Triple Thick Gloss Glaze and Rhinestones, if you so desire! 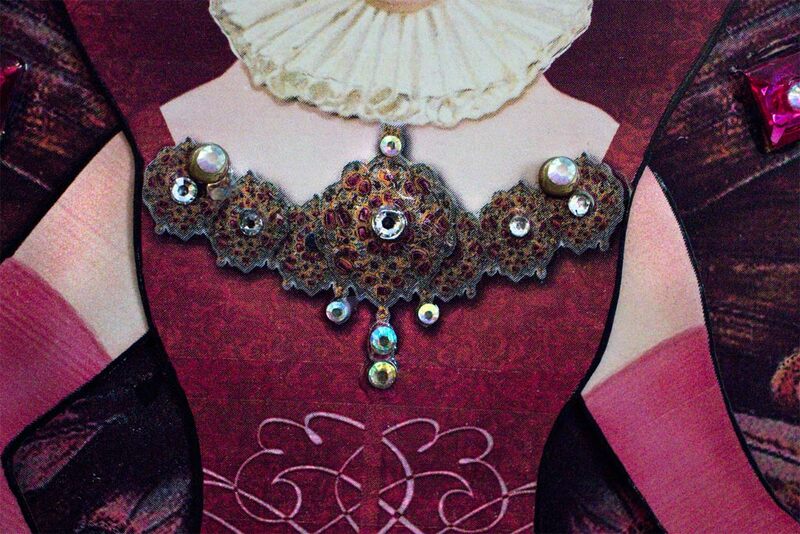 You can even add a tiny rhinestone on top of each brad, for an even fancier look! 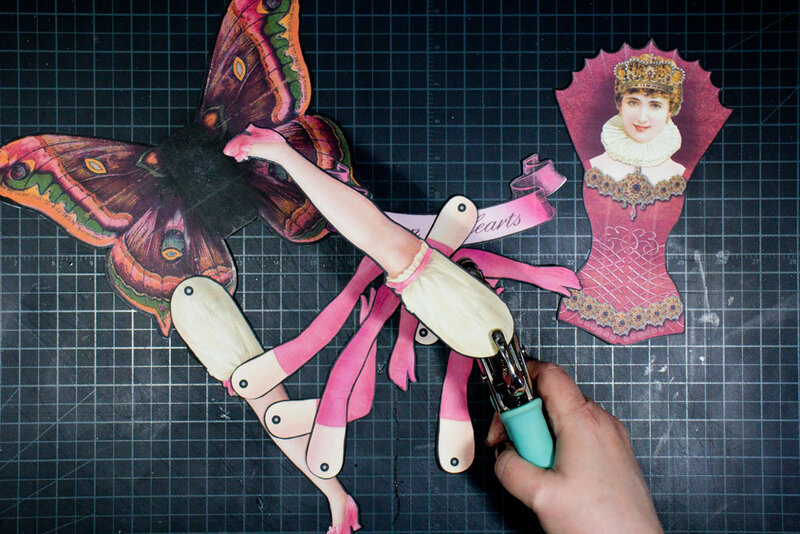 Allow the Triple Thick to dry thoroughly before playing with your fabulous new Paper Art Doll! 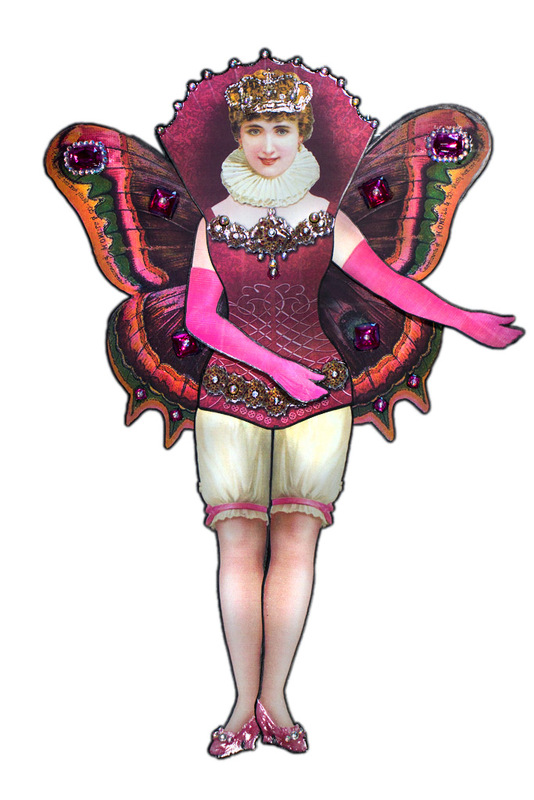 Now, she’s ready to deliver a Message of Affection and Esteem to a dear friend or loved one! 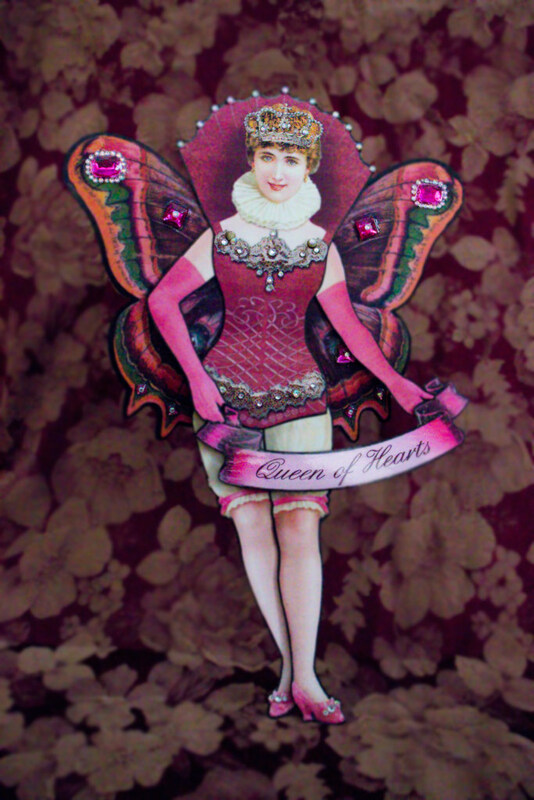 It’s been a joy to design and share the Queen of Hearts Paper Art Doll with you! I hope that you create your own version, gleaming with sparkle and shine! Come visit me at both the Thicketworks YouTube Channel and Thicketworks Blog – we’ll have us some Messy FUN! « Gorgeous Vintage Dance Girl in Pouf Tutu Sketch! absolutely fabulous! 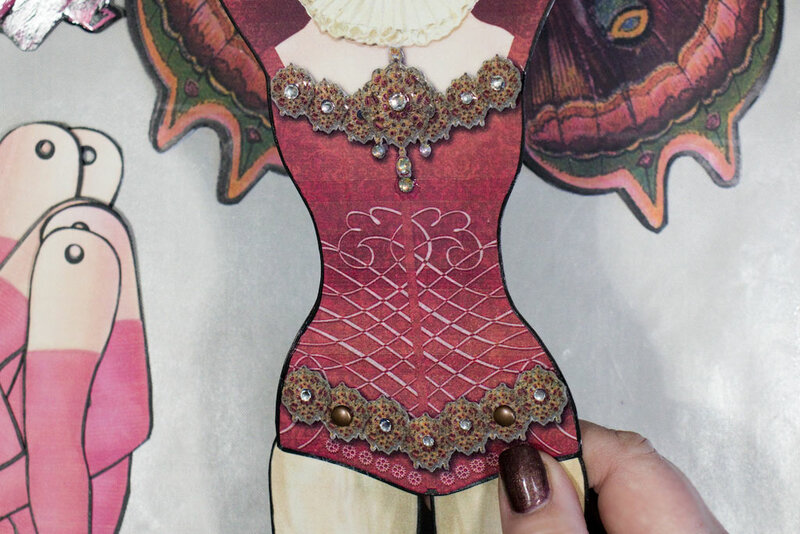 Love jointed paper dolls! I love this piece. 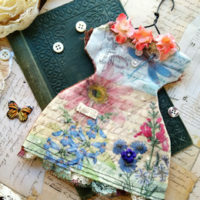 There just something so special about paper dolls. You make them a piece of art. Thank you…I’m definately definitely making this! What size paper should I use? I printed out he wings on 8×10 cardstock and it is huge. Is this the size it should be? You didn’t give the dimensions of the figure. 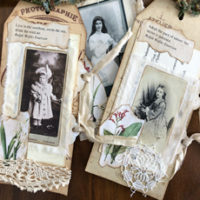 It is so beautiful and I can’t wait to make it. Ooooh….she is a beautiful, sassy lookin’ gal! Now that I am familiar with some of these techniques via MM1 class, I think I will definitely make this beauty soon. I swear Heather, every single time I saw a jewel image here, I said to myself “This is right up Heather’s ally and it will be used in one of her upcoming tuts”. So beautiful to see them make an appearance here. Thank you my friend for your endless creativity and sharing. Fabulously awesome! Thank you for another great tutorial! She is going to have a special place in my studio and will think of you each time I see her. Thanks for sharing. Super Cute! TFS your talent and time with us! 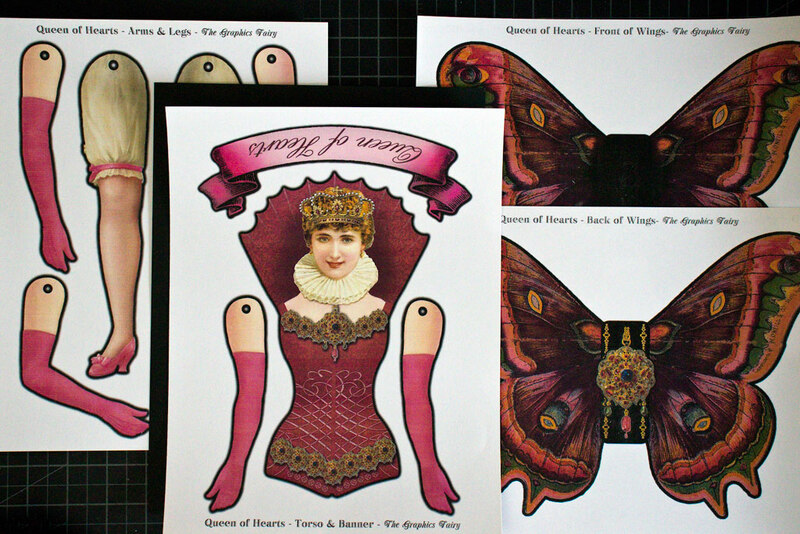 Queen of Hearts paper doll is truly Awesome! Very stunning design! 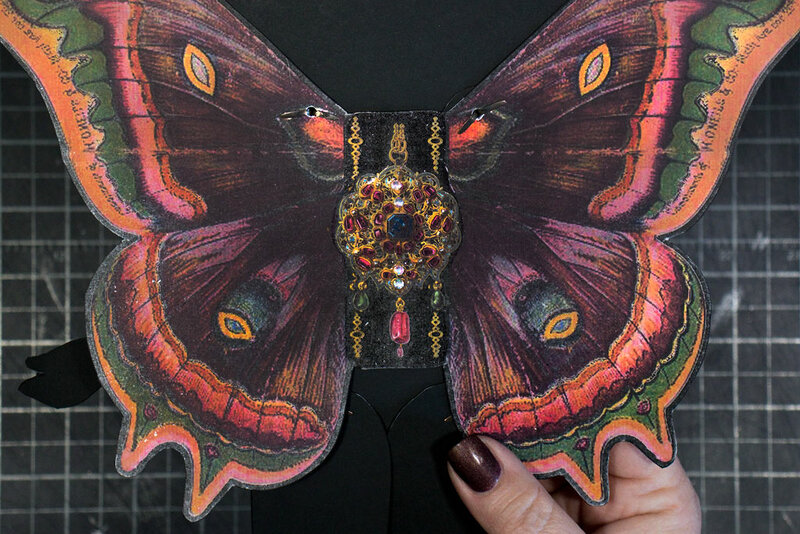 Love the use of either the Cecropia or Promethea Moth as her front wings! Very cool design that I stumbled onto during one of my art heart creative graphics searches on Bing images! Thank you for having such an awesome website! 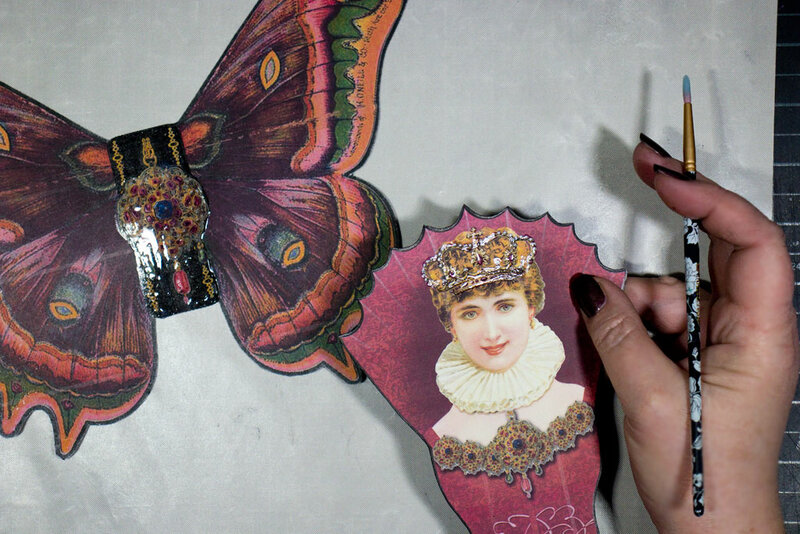 I will be creating the Queen very soon and can’t wait to see all of the other cool and very creative goodies you’ve offered the Whole Wide World! Thanks again and Happy Valentine’s Day!